Andrea Catsimatidis serves as an executive of her family’s company, the Red Apple Group, one of the largest privately held companies in the United States, which owns and operates interests in multiple industries including: energy, real estate, finance, insurance, supermarkets, and aviation. In addition to contributing to the leadership of the company as a whole, she also has specific responsibility as a Principal of Red Apple Real Estate, a member of Red Apple Group’s investment committee, Vice President of First Federal Guarantee Insurance Company, and Managing Director of Gristedes Supermarkets. 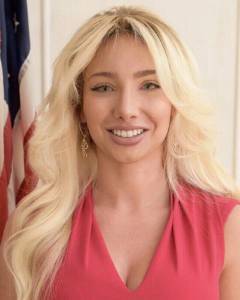 In September 2017, Andrea was elected Chair and CEO of the Manhattan Republican Party and was subsequently elected as a Vice Chair of the New York State Republican Party, in charge of representing all of New York City. Andrea is also a member of the Young President’s Organization (YPO). She serves on the board of the DoughMain Financial Literacy Foundation to promote children’s financial literacy and is actively involved in many other charities. Andrea graduated from New York University’s Stern School of Business with a B.S. in Business Management and double minors in Political Science and Communications.